​I absolutely love this honey and oatmeal soap! It's so moisturizng and perfect for summer when I swim in the salty ocean or in an over chlorinated pool, plus spend way too much time in the sun. This soap has wonderful soothing and healing properties and my skin looks great. I have even used it to shave my legs and my skin doesn't get that "ashy" look I get from other soaps. You saved me!!!! I have severe eczema and I keep getting cellulitis. After the last infection of my face I tried your soap. The cellulitis cleared up and my eczema! I've had eczema for 45 years, but your product cleared it up. Thank you!!!!! This stick is amazing!! We call it the "poo stick" in our house because it gets my baby's clothes clean every time! No more stained clothes to throw away!! Best find I ever came across -will definitely be purchasing more! Everything came clean after this mess thanks to Buncha Farmers!!! 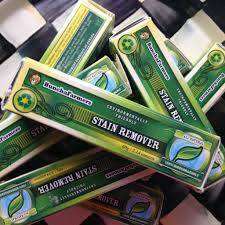 I had gotten sewing machine grease on a customers white cover, tried many different products on scrap material first, then my daughter gave me her stick of your Stain Remover. You saved me from having to redo the job ! it removed it without making a bigger mess as with some of the other products I tried. The stain remover is a huge hit at our drug store!! I personally have used it to successfully remove a significant blueberry stain from a brand new cycling jersey...thank you so much. Also removed black marker from white blouses. This makes it easy to encourage our customers to try the product. Please note that by submitting this, we may use your review on our testimonials page, but we will only publish your name and city and will never share your email address. We've limited file uploads to 5MB, but if you have larger images you'd like to share, please share them with us on Facebook!